Florida Gulf Coast Eagles: Earning top billing in our preview is the defending two-time defending champion, FGCU. 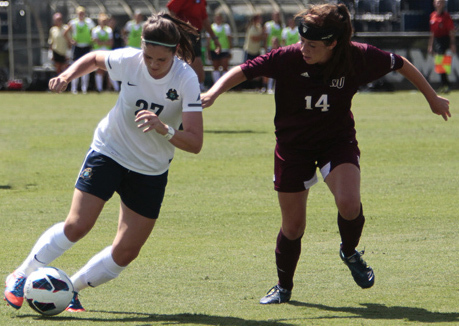 The Eagles lost a key player from last season to graduation in defender Ashley Ciesielczyk. Ashley missed the NCAA regional game against Florida due to suspension, but started 20 games for FGCU and was the Eagles assist leader with 10 on the season. Another loss for FGCU is mid-fielder Danielle Faller a 2nd Team All-ASun selection. Faller was a 21-game starter and was a leader on the field. But even with the losses, the Eagles return one of the most talented teams in the ASun. Coach Blakenship will have the talents of Shannen Wacker, as perennial game-winning goal scorer. Wacker had five last season, which was 17th in the nation. Between the pipes, All-Frosh Team Brittany Brown returns to the Eagles. Brown posted a save percentage of 0.867 and was 24th in the nation in Goals Against Average of 0.651. The FGCU roster is full of young talent including Shea Rhoney who scored six goals, including a game winner against Stetson. Also mid-fielder Ally Kasun returns for her sophomore campaign as the only unanimous selection to the 2012 All-Conference First Team. Kasun had seven goals and seven assists to post 21 points for the season. If that weren’t enough, All-Freshman Team selection Emma Blackwell returns her talents to the Eagles defense. The nest is also going to be full of incoming freshman, Lauren Knight, Ashley Parks, Tabitha Tidwell, and Yazmin Velez. Coach Blakenship welcomes one transfer from the University of Florida Paulina Speckmaier. Without question the Eagles are primed to make a run at the Atlantic Sun Championship and they are the favorite to make another trip to the NCAA Tournament. Jacksonville Dolphins: A 9-7-3 (5-2-2) record for the Dolphins in 2012 was good enough to put them in the middle of the pack. Head Coach Brian Copham enters his sixth season with a history of success for the ‘Phins. In 2011 they shared the regular season title and last season they advanced to the conference semi-finals on the back of returner Kaitlyn Bassett’s six goals (3 GW) and 13 points. Jacksonville will be without mid-fielder, Emily Culbreth, who was a team leader from last season. 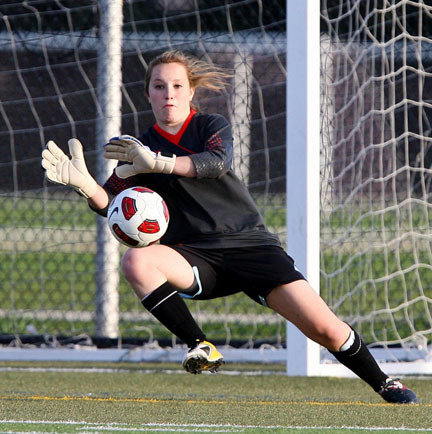 Although there is a void in the midfield, the goal keeper’s position is filled with returning GK Jill D’Amico. D’Amico (Naperville, Ill.) started 17 games for the Dolphins and had a 1.23 Goal Allowed Average came to Jacksonville as the Chicago Tribune’s Player of the Year. Another highlight of last season was Jacksonville’s only All-Conference First Team selection, defender, Alexandra Lee. It wasn’t the amount of goals allowed by the Dolphins that hindered their season, but the lack of success on shot attempts. 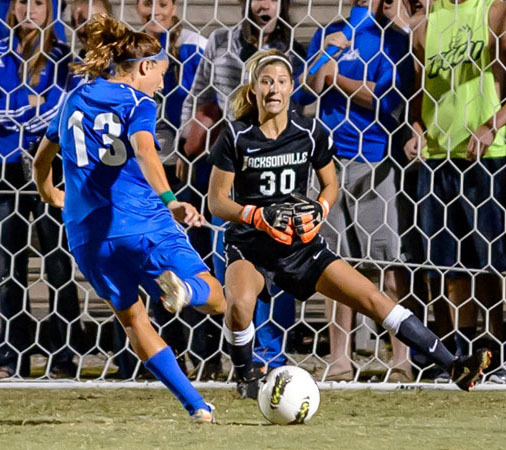 The Dolphins were second in the ASun in Shots, but just sixth in Goals. They averaged 1.37 Goals per Game, which was seventh in the conference. So, where will Jacksonville find goals? Bassett has to be more productive and forward Marie Weckhurst should get involved more. They will get some help from incoming freshman Cassie Elmore, who comes in highly touted from Murietta, California. There are a lot of questions about the Dolphins offense. If Coach Copham can find some crooked numbers on the scoreboard, expect Jacksonville to finish in the top five of the conference. East Tennessee State Buccaneers: The Atlantic Sun 2012 Player of the Year Ramey Kerns shocked Buccaneer Nation as she decided at the end of last season to forego her last season of eligibility and focus on her studies to graduate. The nation’s leading goal scorer announced she would not return to the Buccaneer’s roster card in 2013. 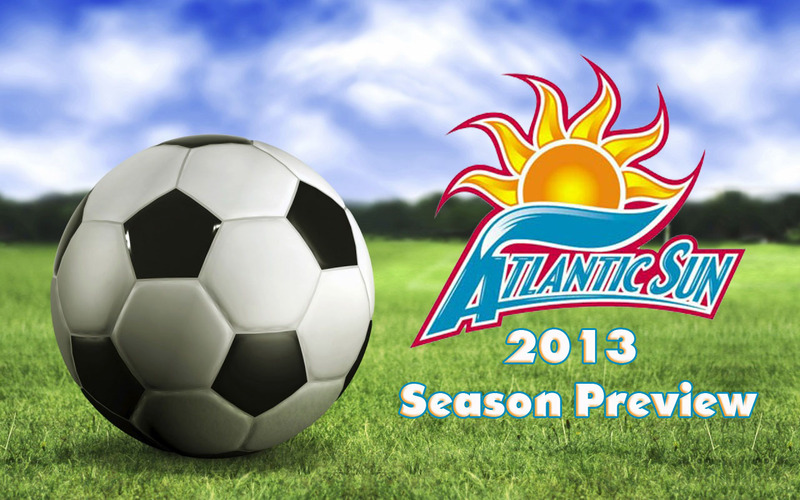 Head Coach Adam Sayers enters his third season looking to improve on the impressive 12-6-0 (6-3-0) campaign in 2012. Without Kerns, that appears unlikely, but the Bucs do have the 2012 Freshman of the Year returning in Sarah Zadrazil. The Austria-native scored 4 goals (2GW), 10 assists, and 18 points in first season at ETSU. She averaged 0.56 Assists per Game, which was 9th in the nation. Her time with the Austrian National squad this past spring should give her an advantage of being an on field leader for the Bucs. Another returning starter will be defender Hannah Short. Short (Bristol, England) is another international player for ETSU that brings great experience of U17 and U19 levels and confidence to the Bucs. She had 8 shots in 2012 and one assist. What the Bucs lack in returning talent, they make up for in incoming talent. Coach Sayers welcomes in four quality signees for 2013. Leading the pack is Cecilia Re from Milan, Italy. Re has an impressive resume including time with Italy’s Women National Team. She had 13 caps (appearances) for the U-17 squad, 18 caps with the U-19 squad and five caps with the U-20 team. Re is a well-traveled Mid-Fielder that should produce for ETSU immediately. The Buccaneers lost a key element in their success last season, but they still have a very good squad. Preseason voters are likely to put ETSU finishing third in the Atlantic Sun. Kennesaw State Owls: The first fifteen minutes of the 2012 season changed the Owls remaining games. In the opener versus Alabama, redshirt-freshman Chelsea O’Callaghan suffered a season ending knee injury. The Owls lost a key element of their team, but Head Coach Rob King forged his team onto a 10-8-1 (6-2-1) record. The Owls also hosted a first round game in the ASun Championship Tournament. Kennesaw State returns the core of the team last season, which included South Carolina transfer and First Team All-Conference mid-fielder Katrina Frost, Alabama transfer and 2nd Team All-Conference defender, Jewelia Strickland, South Carolina transfer and Second Team All-Conference Kelsey Barr, and ASun All-Freshman Team selection Danielle Gray. Frost was the engine for the Owls scoring 10 goals (2GW), 3 assists, and 23 points. Gray contributed 8 goals and scored on 25.8 percent of her shots. Strickland was another efficient striker as she scored two goals on just six shots during 2012. The defense for Kennesaw State will return Alma Gardarsdottir, and Tasia Williams, who transferred from Auburn. The Owls lost four key players from last season, Liz Blackburn, Lexi Hastings, and both goal keepers, Melissa Hutto and Lauren Roberts. Unfortunately, with Hutto and Roberts are gone leaving the keeper duties to incoming true freshman Olivia Sturdivant, which will be the position to watch as the season progresses through a brutal non-conference schedule. She is the only Gk on the roster, so help isn’t available. That is a lot of pressure for a true freshman. Kennesaw State has all the tools necessary to finish in the top five of the conference, but with a freshman between the pipes, it may be difficult. Expect the Owls to finish at fourth in the conference if Sturdidivant has a solid year. North Florida Ospreys: The Ospreys had an interesting season last year as they had a losing regular season record 8-10-2 (5-3-1) but, played very well in the ASun Championship Tournament. They defeated Kennesaw State on the road, but fell to Mercer in the semi-finals. The Ospreys have lost a significant portion of their 2012 lineup. Michelle Larrinaga, Katheryn Husted, and Sadie Mclean are gone, but the top scorers return. Thea Linkfield and First Team All-Conference selection Carolina Lencina bring a serious offensive threat to the field for UNF. Also Rachel Beninati returns as the goal keeper for the Ospreys. Beninati had a 5-5-1 record between the pipes last season, had a 1.96 Goals Allowed Average, and only stopped 69% of the shots on goal. A large signing class of eight recruits will bring in a lot of new talent, but will it be enough to repeat their success last year? Head Coach Linda Hamilton lost seven players off last season’s roster, but gains eight talented recruits. She will be the key to preparing these young women to play at the division I level. Expect a roller coaster season from the blue and white, but they will have enough success to make the conference tournament. Mercer Bears: The final season in the Atlantic Sun for the lone remaining founding member of the conference appears on paper to be another solid lineup. The Bears lost Patricia-Anne Upson who started 21 games for the orange and black, but return one of the top goal keepers in the nation, Maggi Cropp. A 0.291 Goals Against Average and a Saver percentage of 0.923 topped the statistical category for the nation earned Cropp Second-Team All-Conference honors. She had a fantastic year only allowing four goals in 18 matches. The top scorer for the Bears also comes back to Macon. MF/D Lauren Gassie brings her six goals and 19 points back to the lineup along with Second – Team All-Conference honoree forward Tess Patton who scored five goals and had 14 points. Mercer also welcomes back First Team All-Conference selection defender Devon Fry. In addition to the talent already at Mercer, the signed a talented class of seven recruits, including Canadian standout Katelyn Dimpoloulos. The Mercer Bears are good, there is no question, but will they be consistent enough to make it to the ASun Championship for the fourth straight season? For the record, they won it in 2010, but have lost to FGCU the past two seasons. The Bears are a team to watch as the season progresses. Expect Mercer to finish second in the ASun. Stetson Hatters: A revamped program has seen the hiring of a new head coach, Manoj Khettry, and a new coaching staff. The Hatters finished 2012 with a disappointing 3-13-1 overall record and a 1-7-1 conference record. The Hatters do have some light at the end of the tunnel. A decent recruiting class for a program in major transition may be exactly what Stetson needed, fresh blood. So, the program will be interesting to watch as All-Freshman Team selection Mara Keomanivane returns to the Hatters as a MF/Forward. Keomanivane scored three goals a season ago and was second on the team in points (23 points), behind Alyssa Welch (37 points) , who also returns. 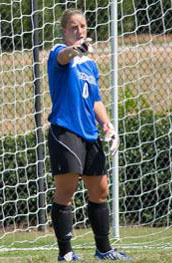 In goal, Victoria Troccoli started 16 games for the Hatters, but struggled. She had a 2.09 Goals Allowed Average, but frankly it wasn’t all her fault. The Stetson defense under performed putting Troccoli in tough spots. Coach Khettry, who was hired in late March, didn’t have a lot of time to get to know his players, but in a recent interview he challenged the fitness level of the returning players. He also commented that the new recruits will have an opportunity to challenge for starting positions. With all of the newness and adjustment, it will be a rebuilding season for the Hatters. They again will be at the bottom of the ASun standings. 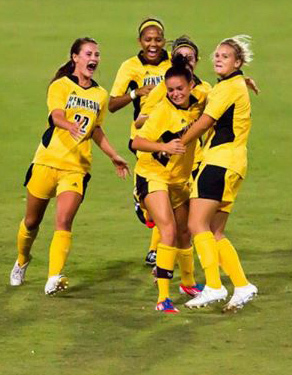 Northern Kentucky Norse: The newbies of the Atlantic Sun conference made a splash in conference play with a 3-6-0 record and an overall record of 6-11-0. The Norse had great play out of returning All-Conference Team selection Megan Fry, who posted 15 points, three assists and six goals. Fry and then freshman Maria Silbersack led the Norse offense. Both return to the team coached by veteran Bob Sheehan who enters his 16th season in Highland Heights, Kentucky. The Norse roster is young and full of talent. With just three seniors on the squad, could their youth make them vulnerable? Not likely, as NKU boosts a very talented lineup. The Norse will likely raise eyebrows again around the conference as they come one year close to being post season eligible. Lipscomb Bisons: A very tough season for L.U. and first year head coach Kevin O’Brien had the Bison finishing the season 2-11-4 (0-7-2). The bright spot for the Bisons was the play of 17-game starter, Erin Zerio, who finished the season 26th in the country in saves (112). Zerio graduated and that leaves the tending job to incoming freshman Anna Buhigas. Like, Kennesaw State a freshman GK and no back up is a dangerous way to play, but Lipscomb is still in a rebuilding phase. They announced the largest signing class in the ASun with 14 players committing to Lipscomb. With all the new talent in Nashville, including several new international players. It will be an interesting season to see who makes the cut and is the cornerstone for the Bisons future. USC Upstate Spartans: At 3-15-0 (1-8-0) The Spartans struggled in every area on the field. There was a compensatory prize in the awarding of Sarah Plantz as Goal Keeper of the Year in the Atlantic Sun with 122 saves, beating out favorite Mercer’s Maggie Cropp. Abbey Minihan enters her second season as head coach with the Spartans and very similarly to Lipsomb and Stetson, the rebuilding continues. Plantz does return for her senior season and will be looked at for team motivation and leadership. In Spartanburg, just six recruits were brought in by Coach Minihan as she also looks to build a winning program almost from scratch. Posted on August 7, 2013, in Uncategorized. Bookmark the permalink. Leave a comment.